The 14th plenary session of the Joint International Commission for Theological Dialogue between the Orthodox Church and the Roman Catholic Church has recently completed its work in Italian Chieti. Head of the Synodal Department for External Church Relations Metropolitan Hilarion of Volokolamsk tells in his interview with Interfax-Religion about its results. - Your Eminence, what agreement have you managed to reach at the meeting in Chieti? - The main result of the 14th plenary session of the Joint International Commission for Orthodox-Catholic Theological Dialogue is an adoption of the joint document dedicated to conciliarity and primacy in the Church of the first millennium. Nine years of the hard work preceded this result. The draft document on the theme was prepared after the session of the Commission in Ravenna in 2006, but we had serious disagreements with its text. As the head of the Russian Orthodox Church delegation I could not agree with the text of the document which represented rather private theological opinions than the teaching corresponding to the church tradition. First, I was the main opponent of the document, then more and more participants in the dialogue shared my opinion, and eventually at the 13th plenary session of the Joint Commission held in September 2014 in Amman (Jordan) that project was rejected and members of the Commission decided to prepare a new document. It is necessary to accept that adoption of the document by the absolute majority of Orthodox and Catholic members of the Commission after long and complicated work has become a success. Both Orthodox and Catholics agreed that history of the Church in the first millennium has a defining character and to achieve agreement on the ecclesiological questions we should be guided by the way the Church was arranged in the first millennium. Such attitude fully corresponds to the teaching of the Orthodox Church as in dialogue with the Roman Catholic Church it has always turned to the authority of the Ecumenical Councils and holy fathers of the first millennium. - What question the Joint Commission will consider at the next stage? - The participants discussed what theme should be chosen to continue the dialogue during the final meeting of the plenary session. On the behalf of the Russian Church I suggested dedicating the next stage of the dialogue to the theme of conciliarity and primacy in Churches of East and West in the second millennium with the condition that the discussion of the Unia will be resumed in its frameworks as this phenomenon appeared after the schism of 1054 and still remains a stumbling block in Orthodox-Catholic relations. It should become continuation of the work started in the 1990s when the document condemning the Uniatism was adopted in Balamand (Lebanon) in 1993. This document should be followed by the next one, dedicated to canonical and ecclesiological consequences of the Uniatism. However, work over this document faced an insurmountable obstacle, which suspended the work of the Joint Commission for six years from 2000 to 2006. When the Joint Commission resumed its work after the six-year break, it was suggested to discuss the question of primacy and conciliarity in the Church. The Russian Orthodox Church agreed to this suggestion with the condition that ecclesiological and canonical consequences of the Unia will be discussed in the context of the theme of primacy and conciliarity. However, during ten years, from 2006 to 2016, the Commission did not return to the topic. The logic of our dialogue demands that when the work over the document on primacy and conciliarity of the Church in the first millennium is completed, we should consider the question of primacy and conciliarity of the Church in the second millennium. Here, we should pay attention to the problem of the Uniatism, which is central for the second millennium and unfortunately it is still actual. Actions of Greek-Catholics in Ukraine raise the problem again and again. 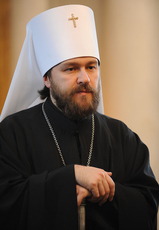 Statements of UGCC supreme archbishop Svyatoslav Shevchuk with attacks against the canonical Ukrainian Orthodox Church and the Moscow Patriarchate sow distrust between Orthodox and Catholics. This February, a historic meeting between Pope Francis and His Holiness Patriarch Kirill took place in Havana, it opened a new page in our bilateral relations. However, right after the meeting, it was subjected to insults of the Greek Catholic Church leaders. The next theme has not been chosen, it was decided to leave the question for further consideration of the Coordination Committee of the Joint Commission, its session will be held in 2017. But we insisted and will insist on the necessity to discuss the theme of canonical and ecclesiastic consequences of the Uniatism. We are not ready to discuss other topics when aggressive anti-Orthodox campaign of Ukrainian Greek-Catholic leaders is continued.